CCC continues to roll out the Major Cycle Routes, MCR’s, for consultation. The most recent is the Nor’West Arc which goes from the University down to Cashmere Road near Princess Margaret Hospital. This link will take you to CCC’s Have Your Say and the details. The issues are that this proposed project fails to meet most of CCC’s own Cycle Design Guidelines for MCR’s. Instead we are offered a smorgas board of on and off road paths and lanes, bi-directional cycle lanes, shared lanes, generally of inadequate width, shared spaces and neighborhood green ways. Just to drive home the point we are offered that and more on Annex Road. Annex Road between Blenheim and Birmingham Roads is a busy industrial area with heavy vehicles and lots of cars. It is also about the only convenient north south link for those coming from the south west. The proposed infrastructure was originally consulted on back in December 2014. 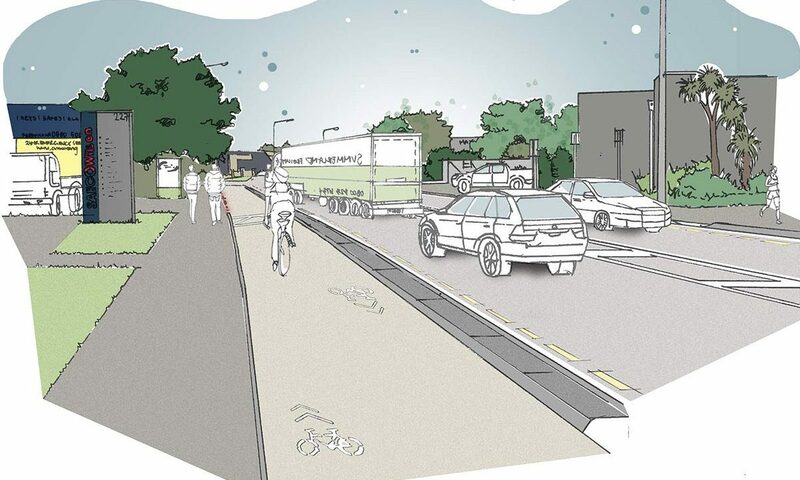 Spokes Canterbury made a submission which called for a complete redesign as what was on offer would discourage both experienced cyclists and the ‘interested but concerned’ cyclists. It was hoped that the Nor’West Arc consultation would offer that opportunity. Working from a creative solution to the unaligned intersections of Hansons/Blenheim/Annex gave hope. And it starts out strong at Blenheim Road with a 4m wide shared path on the west side of Annex Road heading south. A narrow 1.6m wide cycle lane is provided on the east of Annex to accommodate cyclists coming from Blenheim west bound. OK, a good effort. At Lunns Road (railway tracks) the 1.6m wide cycle lane ends. Those riders are to dismount and use the cycle/pedestrian crossing to access the shared path on the west side. With the additional traffic the shared path shrinks to 3.3m width. At Venture Place pedestrians and cyclists are to cross through queued traffic with an ‘island’ refuge in the centre. No signal provided. As designed this is a conflict point and someone could easily get hurt. Shortly past this hurdle the shared path is replaced with a 3m wide bidirectional cycle path with adjoining footpath. The same crossing design is offered again at Nazareth Place. Once across it is all shared space and bus stop until 220 Annex when the 3m wide bidirectional path with footpath reappears. Also appearing here is a shared path of unstated width on the other (north) side of the road. Just how people on bikes or foot got there from the south side is not shown. With no crossing provided this is a conflict point and safety concern. Perhaps the new lane is meant for those brave cyclists who gave up on the confusing infrastructure and chose to mix it up with the heavy vehicles and traffic. (Not a real good choice.) Either way it appears to be there so that people heading onto Birmingham Road don’t clog up the intersection of Annex/Birmingham/Wigram which is also where the Little River MCR joins up to continue south on Annex Road. Shortly before the intersection the south side path vanishes into a shared space at the intersection. This is a common feature for many of the intersections throughout this project. It would seem that CCC has decided that the ‘interested but concerned’ prefer to dismount a lot rather than riding efficiently to their destinations. Probably not a bad thought, but once a person builds confidence as a rider they generally get frustrated by such interruptions. Those who prefer riding get to share the road. Motorists may not take kindly to this insisting that people on bicycles have that wonderful infrastructure off the road. Fortunately this busy intersection does have signals. Once across and through the shared space a 3.8m wide shared path returns on Annex Road. It continues to the end of the cul de sac and the Marylands Reserve cycle path and Southern Motorway underpass. CCC has responded to pressure from NIMBY’s on Victoria Street, the Papanui Parallel MCR and has even extended the submission deadline for the Heathcote Express, Ferry Road section, in response to public outcries. So, please, cry out for the safety of all who will need to use this route. Follow the link above, make a submission and insist that unacceptable dangerous infrastructure is just that. CCC responds to numbers. People who cycle will need to make sure they respond. 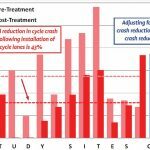 Previous Previous post: How dangerous is cycling in New Zealand?